A képre történő kattintás után megtekinthet minden rendelkezésre álló fotót a (az) Cabanas Twin-hoz. horgászási lehetőség, síelési lehetőség, túrázás, kerékpárkölcsönző, autókölcsönző, transzferszolgáltatás felár ellenében, utazásszervezés, kert, napi takarítás, nemdohányzó szobák, fűtés. 5 Amennyiben Ön megadja a dátumot és lekérdezi a rendelkezésre álló helyeket, az eredményeknél megjelennek a szállodák adott időpontra vonatkozó árai is! 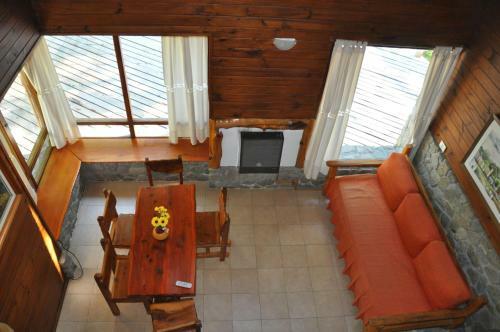 Located 25 km from Huemul Peninsula and 30 km from Paso Cardenal Samore, Cabanas Twin offers accommodation in Villa La Angostura. There is a seating and a dining area in all units. Skiing can be enjoyed nearby and a bicycle rental service is available. Magic Carpet 3 is 3.7 km from the lodge. The nearest airport is San Carlos De Bariloche Airport, 54 km from the property. Please note the based on local tax laws, all Argentinian citizens and resident foreigners must pay an additional fee (VAT) of 21%. Only foreigners who pay with a foreign credit card, debit card or via bank transfer are exempt from this 21% additional fee (VAT) in accommodation and breakfast when presenting a foreign passport or a foreign ID along with a supporting document handed by the national migrations authority, if applicable. Please inform Cabanas Twin in advance of your expected arrival time. You can use the Special Requests box when booking, or contact the property directly with the contact details provided in your confirmation. Guests are required to show a photo identification and credit card upon check-in. Please note that all Special Requests are subject to availability and additional charges may apply. Please note that the check-in and key-collection take place at: Ruta Nacional N°40 y Rio Bonito, hostería Portal de Piedra - Puerto Manzano, 8407 Villa La Angostura.